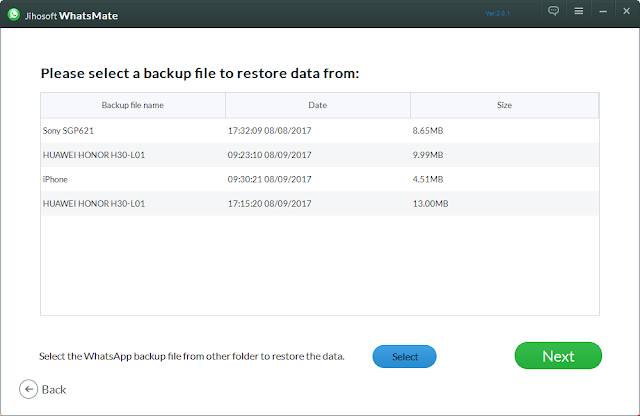 Backup and Recover data, including contacts, call logs, pictures, videos, audios, documents and other files on Samsung, HTC, Sony, Nexus, Motorola, Huawei, Xiaomi and etc. After using WhatsApp for a long time, the growing chat history unavoidably takes up a large amount of space on your phone and make it slow down and become sluggish. In order to solve this problem, you have to clean your bloated WhatsApp chats. But before doing that, we suggest that you should use an Android WhatsApp chats backup tool to save your WhatsApp chats to computer in case of wrong deletion. 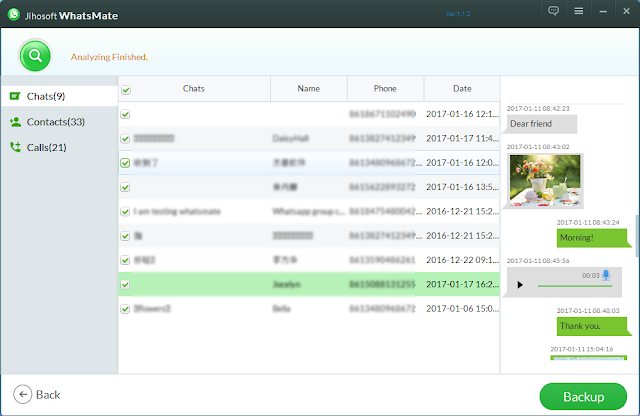 Here we recommend you Jihosoft WhatsMate, which is our featured product developed to help you back up and restore WhatsApp chat history on Android. Moreover, you can also use this tool to export WhatsApp contacts, photos, videos, voice notes and so on from Android to PC in just a few clicks. In addition, this is an all-in-one WhatsApp manager, enabling you to recover deleted WhatsApp data from Android devices, such as Samsung, HTC, Sony Xperia, LG, Google Nexus and etc. Firstly, run the program and choose “Backup WhatsApp data to computer”. Then, connect Android to computer and enable USB debugging. When there appears a dialog on the phone screen asking for permission to access phone’s data, tick "Always allow from this computer" and tap “OK”. Afterwards, the program will begin scanning your phone. 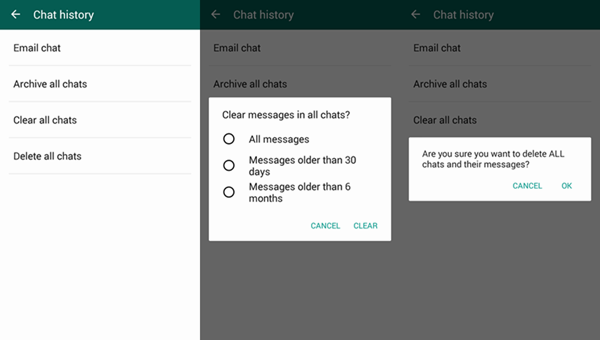 After scanning, choose “Chats” on the left sidebar and then select specific WhatsApp chat history to back up. Before tapping “Backup”, you can preview the chats you choose on the right of the program interface. 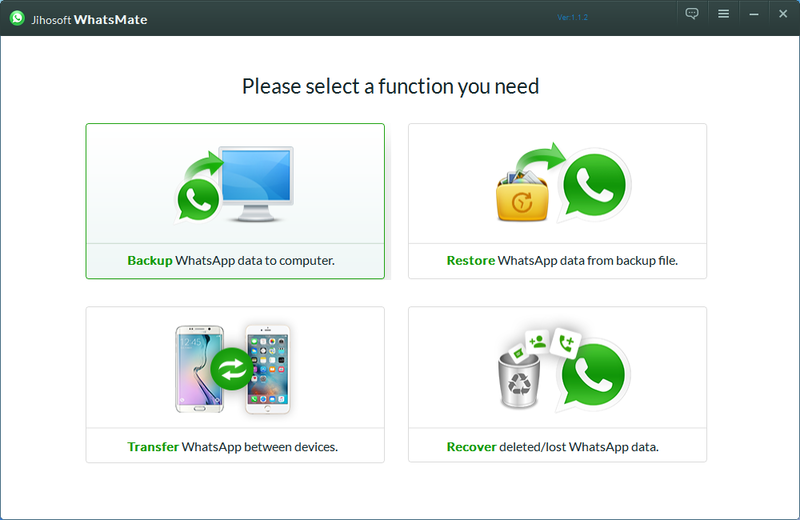 When you want to restore the WhatsApp chats, please choose “Restore WhatsApp data from backup file” on the homescreen of the program. And then choose one backup file to restore. How to clean up your WhatsApp? After backing up all your chats, now you can start to clean up your WhatsApp. Long tap on the message/conversation/group you wish to delete, and then tap “Delete” when prompted. Go to WhatsApp Settings > Chats and calls > Chat history > Then choose “Delete all chats” or “Clear all chats”. - Delete all chats: delete all individual conversations and all messages inside of them, but groups will still in your Chats list. - Clear all chats: delete all messages both in individual conversations and groups, but will leave all conversations and groups in the Chats list. How to Transfer WhatsApp Messages from iPhone to Samsung Galaxy? This autumn we will witness a spate of new android smartphones, and maybe some iPhone users think now might be the perfect time to switch from iPhone to Android. They just couldn’t wait to purchase one, like the upcoming Samsung Galaxy Note 7. But before they making any purchases, one important consideration is data transfer between iPhone and Samsung Galaxy. This question has plagued many new Android device users. Especially, now WhatsApp is the most popular instant messaging app for most of us. And every time we switch to a new phone with different operating system, we have difficulty in transferring WhatsApp chat history. But luckily, we are here to guide you to migrate WhatsApp messages from iPhone to Samsung Galaxy by using Samsung Smart Switch, or you can do it easily with a One-Click WhatsApp Transfer Tool.